Amiri Baraka once wrote that Black music, “to retain its freshness, its originality, its specific expression of its own history and contemporary reality in each generation creates a “new music.” This was yet another articulation of what Baraka once called the “changing same”—the thing that links Black expressive culture to a commitment to innovation, while remaining wedded to the traditions that birthed it. 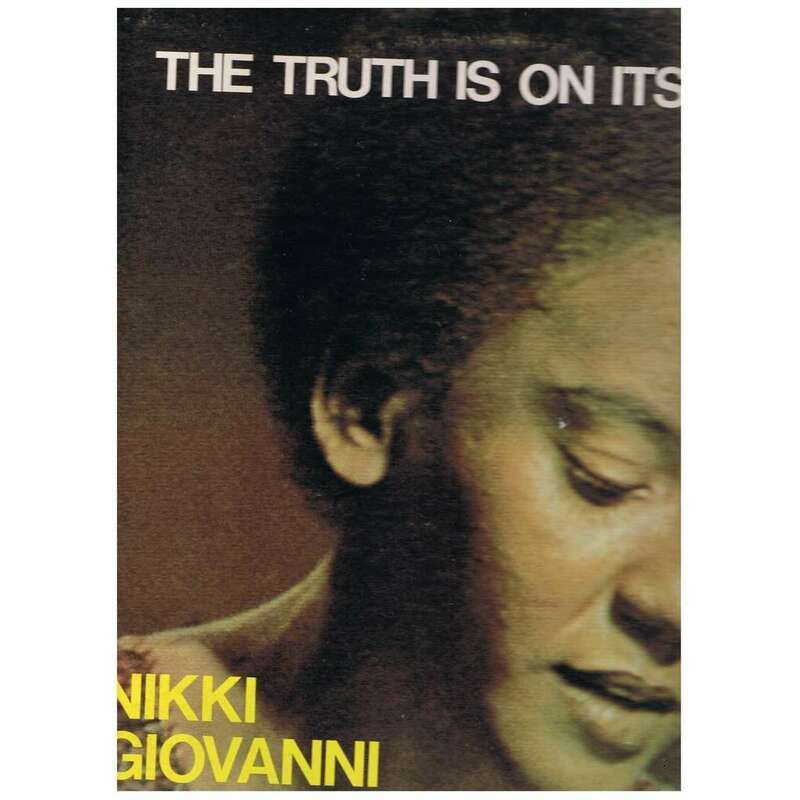 No one understood that better than Nikki Giovanni, when she went into the studio more than 40 years ago to record Truth is On Its Way. At the time, Giovanni was one of the most visible and provocative poets of the Black Arts Movement—Baraka, Don L. Lee (Haki Madhubuti), Sonia Sanchez and the late Henry Dumas are some of the others. The Black Arts Movement was premised on the idea of an art “for the people,” thus many of the movement’s artists sought to make an explicit connection to folk up on the boulevard (you can’t be on the boulevard if you don’t talk like you from the boulevard). For Giovanni though, it wasn’t just about the folk up in the club on Saturday night, but also the folk in the pews on Sunday morning. I was five years old when my mother walked into the house with a copy of Truth is On the Way. I’ve listened to the recording hundreds of times since then; indeed Giovanni’s cadences are incorporated in the rhythms of my own writing style. At the time I didn’t fully understand the genius of Giovanni’s vision—she was blatantly trying to bring the profane in conversation with the sacred, two decades before Kirk Franklin and later Kanye West would bring ghetto theodicy to the top of the pop charts. Truth is On Its Way features recordings of some of Giovanni’s signature poems, mashed over classic gospel recordings performed by the New York Community Choir (under the direction of Benny Diggs). And it was Ms. Franklin who inspired the album’s most poignant moment, via Giovanni’s “Poem for Aretha.” As the lead vocalist of the New York Community Choir mournfully sings “Nobody Knows the Trouble I’ve Seen,” Giovanni gives praise to the woman who is, arguably, the most important and popular Black women artist ever. Written at the height of Franklin’s fame, Giovanni places Franklin within the context of great Black music (“pushed every Black singer into Blackness”) and the tragic lives of her artistic foremothers (“Aretha doesn’t have to re-live Billie Holiday’s life/doesn’t have to re-live Dinah Washington’s death”). The gravity of Giovanni’s poem is so clear forty-years later, as we've witnessed the slow demise and death of Whitney Houston. Though Gil-Scott Heron and The Last Poets are often credited as the “god-fathers” of hip-hop, Giovanni, who recorded five albums in the 1970s, doesn’t get nearly enough credit for her influence. It’s a track like “Ego Tripping,” the only track on Truth is On Its Way not backed by Gospel music (though no less spirtual), that one hears the impact that Giovanni had on the poetic sensibilities of the hip-hop generation—the song is the very essence of an old-school rap boast (“the filings from my finger nails are semi-precious jewels”). “Ego Tripping” was eventually featured in an episode of A Different World, performed by the women in the cast and remixed by Blackalicious on their disc Nia (2000). And it’s clear that hip-hop’s poet laureate Rakim Allah must have been thinking about Giovanni’s line “I turned myself into my self and was Jesus” when he wrote “My name is Rakim Allah / And R & A stands for 'Ra' / Switch it around / But still comes out 'R'" on his classic “My Melody.” It’s about time we give Nikki Giovanni her due as a god-parent of hip-hop. Earlier Version Originally Published @ Black Voices/AOL (2005). Mark Anthony Neal is the author of five books including the forthcoming Looking For Leroy: (Il)Legible Black Masculinities (New York University Press). He is professor of Black Popular Culture in the Department of African & African-American Studies at Duke University and the host of the Weekly Webcast Left of Black. Follow him on Twitter @NewBlackMan.